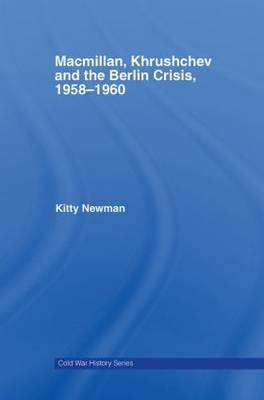 This new study casts fresh light on the roles of Harold Macmillan and Nikita Khrushchev and their efforts to achieve a compromise settlement on the pivotal Berlin Crisis. Drawing on previously unseen documents and secret archive material, Kitty Newman demonstrates how the British Prime Minister acted to prevent the crisis sliding into a disastrous nuclear conflict. She shows how his visit to Moscow in 1959 was a success, which convinced Khrushchev of a sincere effort to achieve a lasting settlement. Despite the initial reluctance of the French and the Americans, and the consistent opposition of the Germans, Macmillan's subsequent efforts led to a softening of the Western line on Berlin and to the formulation of a set of proposals that might have achieved a peaceful resolution to the crisis if the Paris Conference of 1960 had not collapsed in acrimony. This volume also assesses Khrushchev's role, which despite his sometimes intemperate language, was to secure a peaceful settlement which would stabilize the East German regime, maintain the status quo in Europe and prevent the reunification of a resurgent, nuclearized Germany, thereby paving the way for disarmament. This book will be of great interest to all students of post-war diplomacy, Soviet foreign policy, the Cold War and of international relations and strategic studies in general.